The Super Bowl is one of my favorite sports days, because it means the CopyKat Super Bowl Recipe Contest. This year’s winner was the Habanero Hot Wings thanks to the votes of viewers like yourself. 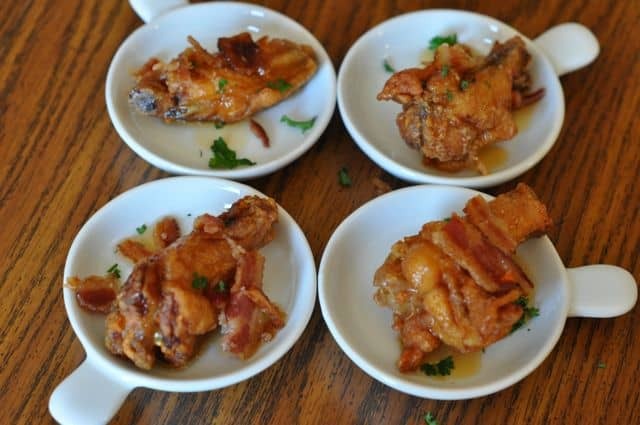 You can make these delicious wings they are fun to make. You don’t have to stop there, you can try some of the other Super Bowl Recipes. Honey Habenero Wings – these hot wings are a real delight. They are seasoned and deep fried hot wings that are finished with a honey and habenero glaze, and if that isn’t enough, crumbed bacon is also added just before serving. Super Bowl Pizza Bun Sliders – Imagine a marriage been Cinnabon, and your favorite pizza parlor. These pizza inspired rolls can be made ahead and served hot or cold. Buffalo Chicken Jalapeno Poppers – So you can’t have a Super Bowl Party without buffalo chicken dip, well you can’t unless if you have these buffalo chicken dip inspired jalapeno poppers, and yes, we wrap these with bacon. Sausage Potato and Cheddar Stew – If you are where it is cold, this soup is for you. Best of all this is slowly simmered in a crock pot, and when you are ready, you can have a dish of this hearty stew. Crispy Fried Wonton Pizza Bites – you don’t have to try your won tons, you can bake them in the oven. These crispy oven baked treats are a great combination of crispy won tons, and pizza. Buffalo Chicken Pizza – here the flavors of buffalo chicken wings, and pizza. These home made pizza is topped with spicy buffalo style chicken. You can start with a pre-made crust to help save time. Italian Rice Balls – Want something a little fancy? You can make up these creamy deep fried rice balls. These rice balls are seasoned with cheese and more to give you a wonderfully rich flavor. Beer Dip – Beer and cheddar cheese go together like peanut butter and jelly. These creamy dip goes well with pretzels and toasted bread. Mississippi Sin – Fresh bread is sliced open and filled with a cream cheese filling that is heavenly. Stuffed with cheddar cheese, ham, and more, it is almost a sin not to enjoy this recipe. Where is the recipe for these wings. I see the video but the ingredients and amounts are no where that I can find.